Erin Hvizdak is an intern at the Evanston History Center and is getting her Masters in Women’s and Gender Studies at Loyola. She holds a Masters in Library Information Studies from the University of Wisconsin-Milwaukee. If you visit the Evanston History Center you may see Erin helping in the archives, or giving tours. In the spring she will talk about the Evanston Community Kitchen in our April Under the Buffalo. In 2013, the Woman’s Club of Evanston will celebrate the 100th anniversary of the building of their clubhouse, so prominently featured at 1702 Chicago Avenue in Evanston. While the women had been pursuing this idea of a clubhouse as early as 1894, by 1913 they had firmly established themselves as a strong community force and a necessary presence in Evanston to achieve reforms in social services during the Progressive Era. That the building was finally realized during the early 1910s was no coincidence; “civic” improvement became of the utmost importance in these years, with the women concentrating their efforts on city cleanliness and the creation of public spaces. Playgrounds and parks were established to keep children out of the alleyways, garbage pick-up was systematized to minimize the “fly menace,” advertisements at El stations were kept to a minimum to promote aesthetic appeal, food inspection in markets became city ordinance, and much more. Evanston was no stranger to buildings built by and for women. Frances Willard had raised community funds to build the Evanston Women’s College building, Willard Hall dormitory, and the “Rest Cottage” at 1730 Chicago Avenue in Evanston, as well as the Woman’s Temple at the corner of LaSalle and Monroe in Chicago. The latter two were built specifically for use by the Woman’s Christian Temperance Union. These buildings provided communal spaces for women to assemble outside of their own homes, and were a visual demonstration of their permanence in public and in the community. Not only were women no longer relegated to their homes, but they were doing something – or doing everything, as Willard suggested they should. These buildings all depended on fundraising in the community and in turn gave back to this community. 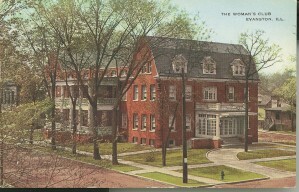 Postcard of the Woman’s Club of Evanston. Courtesy of Evanston History Center. On all sides was heard the same advice – “build something we all can be proud of,” “Consider the future of the town as well as of the club,” “Build on a corner, not on an inside lot.” Other clubs desiring the use of the hall, teachers wishing to give musicales or entertainments, young people who hope to use the hall for dances, citizens interested in better things for Evanston and desiring a hall for civic meetings, all urged the club to greater effort. This building was to “in the fullest measure possible provide a civic social center for Evanston.” The women specifically focused on the house as a center for young people to hold dances, and also the ability for themselves and other groups to hold lectures, concerts, meetings, plays, banquets, and bazaars in both their large and small auditoriums and rooms. Opening the clubhouse up for rentals was not only a way to build a sense of community for its citizens, but was also a strategy by the Woman’s Club to gain a source of income and thus independence; it was truly an investment in the club’s future. The club created a Ways and Means Committee and a Building Committee, and purchased a lot at Davis and Chicago from Marie Kidder, a woman from one of the earliest and most established families in Evanston. A few months later, it was exchanged for a “better” lot at Church and Chicago, the current location. Ernest Mayo, a favored architect in Evanston and the entire North Shore, was approved as the architect for the Woman’s Club building in January of 1911. Records further indicate that the famous firm of Holabird and Roche acted as Advice & Counsel. Fifty loyal members of the Club have volunteered the task of canvassing, in pairs, all the big hearted men of Evanston. It will be embarrassing work for them. So, please make it as easy as you can for the two members who will call on you. Certificate Subscription. Courtesy Northwestern University Archives, Collection 55. We, as a club, are most appreciative and grateful for all the assistance which the men and women of this city have given us, whether financial or otherwise, and hope that the good which can be accomplished through the use of our new building, the benefit it can be to the city of Evanston, will in a slight degree repay the kindness of its citizens… We are working for the betterment of humanity and that covers a vast field of labor for it reaches into all lines of philanthropic and social work. 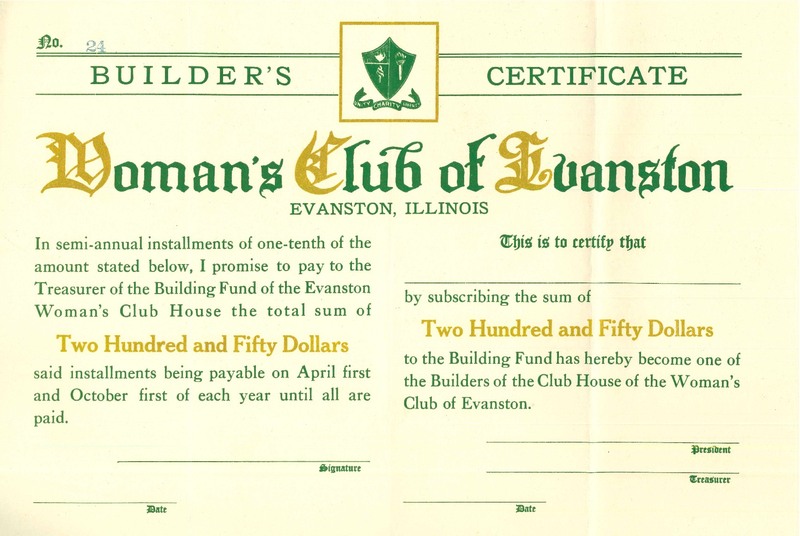 These, then, are the reasons for the building which is rapidly rising on this corner and we trust that Evanston, as a city, and the citizens of Evanston will be justly proud and appreciative of the Woman’s Club and of its club house. 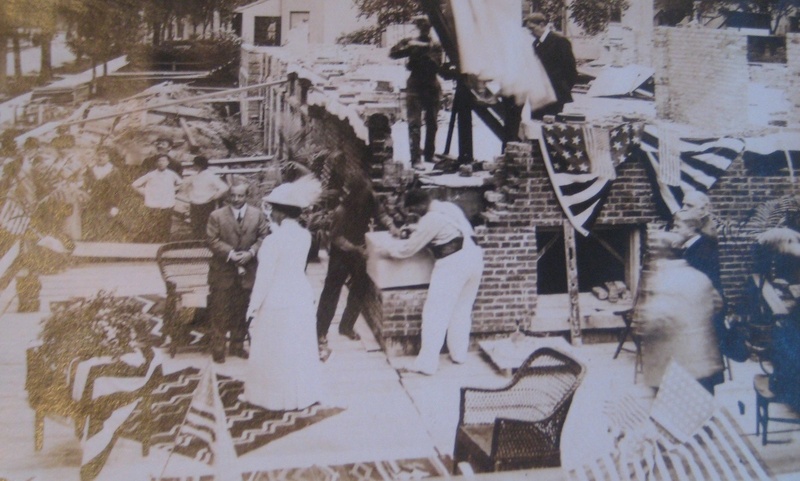 Cornerstone Celebration, May 28, 1912. Courtesy of the Woman’s Club of Evanston. Such sentiments challenge the “boundaries” of the clubhouse. The walls are not closed, but permeable and open. Further, the process did not end with the grand opening, during which the Club hosted almost 1000 people on March 11, 1913. Rather, the building continually changed and morphed to meet the needs of the club and the community to ensure the structure’s longevity. In only the first club year with the new building, the lawn was spread with fertilizer, three new elm trees were planted, and shrubbery, tulips, iris beds adorned the property. While the house was built to fit the needs of the club, changes in the club influenced further changes in the house. For example, monthly luncheons became permanent by 1915, and required that the flow of the house be changed: A third door was opened between the bowling alley and long corridor, while an exit was made between the bowling alley and street. The changes and improvements have continued throughout the last decade, along with preservation efforts such as placing the building on the National Register of Historic Places in 2006. This greatly restricts alterations but ensures its presence and protects its integrity for years to come. Like the Woman’s Club building, the walls of the Dawes House are structurally sound, but also permeable and open. Although it was a single-family residence, it is here to tell the story of the entire community. You can come to the Dawes House to find out what life was like “back then” in Evanston, both through the exhibits and also by imagining yourself immersed in the time, as you walk through the rooms and learn about the furnishings and architectural details. It promotes a sense of togetherness for its residents by holding events such as the ice cream social, free to everyone during the month of July. It also continually morphs to meet the needs of the community, for example, by building the archives room in the basement, so that anyone in Evanston can research the history of his or her house or organization. Lastly, it morphs to meet its own needs, as the staff has, over the decades, tirelessly repaired its aging structure so that it can continue to tell the story of this community. Most recently, the concrete foundation of the former conservatory was re-poured and a fence added so that there is yet another outdoor space to enjoy; further, plans to add and utilize geothermal energy are an exciting step to make the house more efficient and sustainable. And while this is a house for the community, it has also been preserved by and depended on the support of the community for its existence. Through your admission fees, memberships, attendance at events, support of our ongoing adopt-an-artifact program, volunteer hours, and generous donations, we have been able to truly make this a team effort to preserve our history. We thank you so much for your continued support and look forward to telling the story of Evanston’s history for generations to come. Northwestern University Archives, Records of the Woman’s Club of Evanston, Coll. No. 55. Fundraising pamphlet, 1911, Box 28, Folder 5. Northwestern University Archives, Records of the Woman’s Club of Evanston, Coll. No. 55. Board Minutes, January 24, 1911, Box 16, Folder 9. Northwestern University Archives, Records of the Woman’s Club of Evanston, Coll. No. 55. Campaign Announcement, 1912, Box 27, Folder 16. Northwestern University Archives, Records of the Woman’s Club of Evanston, General Meeting Minutes, December 19, 1911. Box 18, Folder 3. Northwestern University Archives, Records of the Woman’s Club of Evanston, Coll. No. 55. Treasurer’s Report, Final Building Statement, April 22, 1914, Box 28, Folder 8. Pingback: Evanston Women's History Project » Blog Archive » A 100 Year Old Clubhouse! This is a fascinating slice of American women’s history. What a great article.